Your Great Website Starts Here. Master RapidWeaver and take control of your website with the most comprehensive website design training available anywhere. Your website needs to be more than just nice-looking. An effective website captures your visitors and achieves the goals you have for it. Our tutorials offer a multitude of strategles you can employ. Mobile devices account for a massive amount of web traffic, so your website should be optimized for phones and tablets. 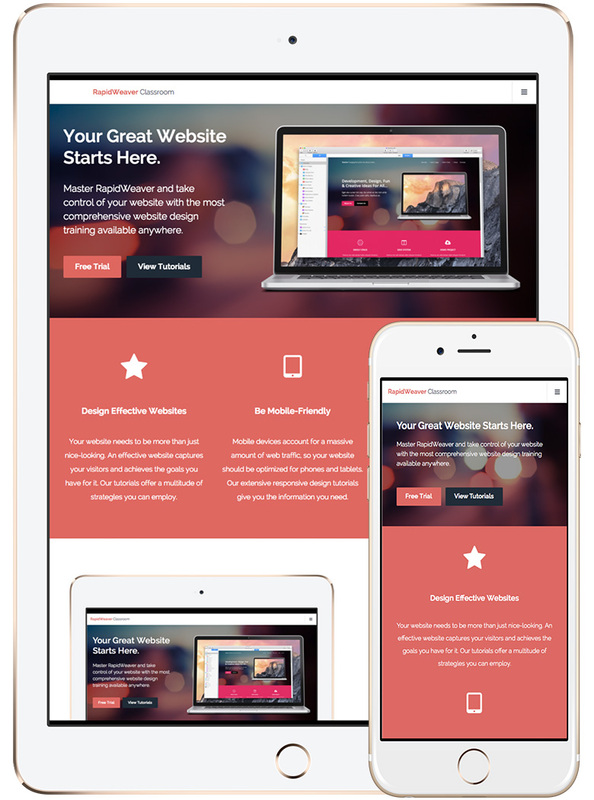 Our extensive responsive design tutorials give you the information you need. Your great website isn't enough if it can't be found online. Our detailed search engine optimization (SEO) tutorials give you techniques and strategies to optimize your website for searches. So many topics, so much detail. It’s all just a few click away. Watch when you want, at your own pace. No dress code required. The tutorial library is constantly growing with the latest and greatest. Navigate the tutorials in a variety of ways to find what you need. Subscribers receive exclusive discounts for addons. This useful resource ensures you’ve done it all before you go live. It’s easier to make decisions when you have a reliable endorsement. 10+ years of RapidWeaver experience fuels this training. Get familiar with the quality and level of detail in our tutorials before you begin your subscription. Get personalized support for times when you need more than what video can provide. RapidWeaver Classroom consistently receives the highest praise from its students. Our RapidWeaver video tutorials cover just about every topic imaginable. It's not just about RapidWeaver and its add-ons either -- a variety of website development topics are covered in-depth.